Tue-Fri 8:30 a.m. 6:00 p.m. 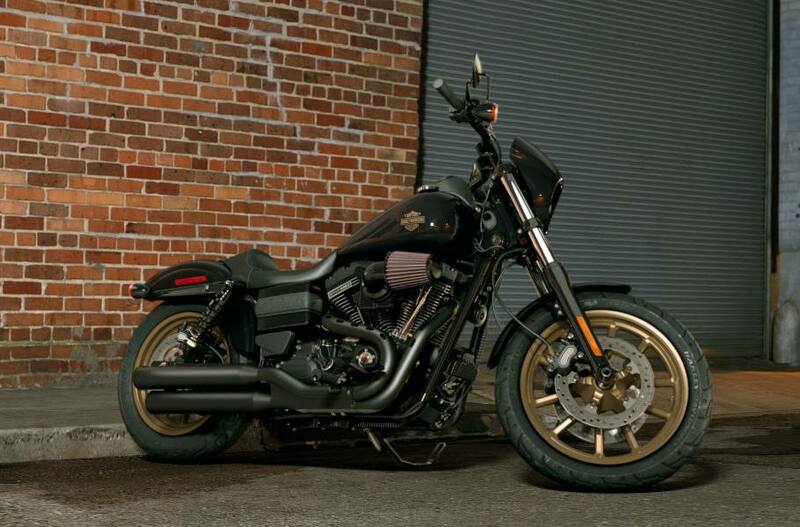 The Low Rider® S takes the factory custom genre to a raw and powerful new edge. Get behind the fixed speed screen and hang on. Back Alley Brawler: In 1977, when the first Harley-Davidson® Low Rider® rolled off the line, it pushed the limits of factory custom design to a place they’d never been. Now, the Low Rider® S is taking the genre to a raw and powerful new edge. We mounted our Screamin’ Eagle Twin Cam 110™ engine in a nimble Dyna chassis and installed a heavy breather intake. We added tall bars, mid-mount controls and a new seat that position arms up and out and feet square, along with premium front and rear suspension, giving the rider everything required to put the massive power to good use. We stripped down and blacked-out the rest with gold accents like the tank badge and pinstripe and matching split five-spoke cast aluminum wheels. Get behind the fixed speed screen and hang on. Authentic Styling: Factory custom is about pushing the limits. And the Low Rider® S pushes them to a new edge. From the fixed speed screen in the front to the chopped fender in the rear, it’s raw custom style turned into dark metal. The star of the show is a blacked-out Screamin’ Eagle® Air-Cooled Twin Cam 110™ engine. Give it a good look. You’ll get the picture. Iconic Engine: We mounted the biggest engine we make in a nimble Dyna frame and gave it a heavy breather air intake. 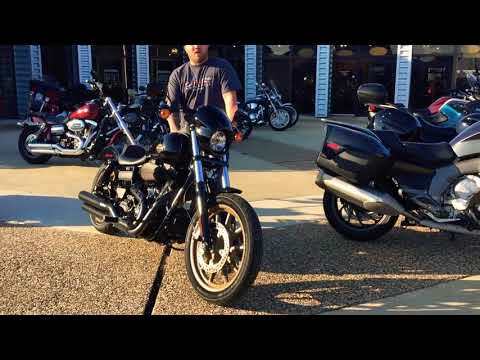 When you get on the Low Rider® S, your throttle hand is directly connected to a Screamin’ Eagle® Twin Cam 110™ engine set up to breathe free. You get big horsepower and loads of low end torque delivered to the pavement through our smooth shifting, durable six speed Cruise Drive® transmission. Because big power means a bigger rush. Comfort: Long miles are easy on the Low Rider® S. The low-profile seat has new foam to keep you comfortable and riding hard, instead of looking for the next place to stop and rest. There’s a premium ride cartridge front suspension to give you a smooth ride and confidence in the corners. And the rear suspension features premium emulsion type shocks that are also smooth over the bumps and solid in the corners. If you like big miles, you’ll like this ride. Blacked-Out Styling: The Low Rider® S has blacked-out finishes in spades. Check out the engine, the pipes, the paint on the tank and fenders. There are black mirrors, a black fixed speed screen, a wrinkle black tank console. You get a black handlebar riser and black triple clamps. The brake and clutch levers are black. The instrument trim rings are black. Every Harley® has some darkness. With this one, it lives on the surface. Fixed Speed Screen: The fixed speed screen on the new Low Rider® S leaves no question as to the attitude of this motorcycle. Can you get behind it? Vivid Black Paint and New Tank Emblem: No one does black like Harley-Davidson® does black. The Vivid Black paint on the Low Rider® S is a rock-solid example of that, deep and rich with a liquid finish. It’s a fitting stage for the classic metal bar and shield tank emblem designed and finished in gold specifically for this motorcycle. We go the extra mile on details. New Wrinkle Black Console: All the shades of darkness come to light on the Low Rider® S. Notice the new wrinkle black console set against the liquid gloss of the vivid black tank paint. Inside it, you get a speedometer and tach finished, of course, with black trim rings. New Split 5-Spoke Cast Aluminum Wheels: The Low Rider® S gives you the classic, muscular look of split 5-spoke cast aluminum wheels. They’re finished in a new denim gold color that matches the color of the tank emblem. This is the art of factory customization rolling forward. Blacked-Out 2-1-2 Shotgun Exhaust: The Low Rider® S feeds its sound to the street via blacked-out, shotgun-style 2-1-2 Collector exhaust with dual mufflers. When you get up close, you’ll notice slots in the exhaust shields adding to the aggressive look. Chopped Rear Fender: The early custom bikes were called choppers for a reason: namely, all the metal that was chopped off the bikes to up the power to weight ratio. The Low Rider® S motorcycle keeps the tradition rolling with a chopped rear fender of its own. Side Mount License Plate: The chopped rear fender and custom look of the Low Rider® S are highlighted by the side mount license plate. Screamin’ Eagle® Air-Cooled, Twin Cam110™Engine Heritage: The knowledge of what makes an engine truly move a rider runs deep at The Motor Company, and it was put to good use when we created this Twin Cam 110™ engine. We sweat bullets pushing design and technology forward, without compromising any of Harley-Davidson’s unique styling.Evolved, yet carrying on the legacy of the Flathead, Knucklehead, Panhead, Shovelhead, Evolution™ and Twin Cam engines that came before. The performance and durability are a direct result of untold miles logged on the V-Twin since 1909 and the proud heritage that comes from a century’s commitment to life on two wheels. Screamin’ Eagle® Air-Cooled, Twin Cam 110™Engine Power: The Screamin’ Eagle® Air-Cooled Twin Cam 110™engine in the Low Rider® S isbuilt to deliver big power on the low end and plenty to keep you happy on the high end.There’s a reason we’re called The Motor Company. And once you send some fuel to this one, you’ll know what it is. Screamin’ Eagle® Air-Cooled, Twin Cam 110™ Engine Innovation: Fire upthe Twin Cam 110™ engine and feel the low-end torque unleashed. The colossal 110 cubic inches provide seemingly endless torque with adrenalin pumping pull through all six gears. Six speeds, a strong driveline and a low cruising RPM couldn’t feel better. Gloss Black Heavy Breather Performance Air Intake: The Low Rider® S gives you the awesome power of a Screamin’ Eagle® TwinCam 110™ enginefed by a heavy breather performance air Intake finished in gloss black. Fire it up. You’re going to like what happens when the spark meets the fuel/air mixture inside the massive combustion chambers. Premium Ride Cartridge Front Suspension: The premium ride cartridge front suspension on the Low Rider® S keeps the tire in contact with the road to give you confidence in the corners and lets you cover long miles in comfort. Riding hard is easy on this machine. New Solo Seat: The new seat on the Low Rider® S is low-profile, but there’s new foam that keeps you comfortable on long rides. There’s also a nice, deep scoop that lets you tuck yourself tightly into the bike and keeps you planted. Premium Emulsion Type Shocks: The tall suspension on the Low Rider® S features premium emulsion type shocks for a smooth ride and rock-solid performance. Make no mistake. We built this one for those who like to ride long, hard and often. Recommended 91 octane or higher fuel (R+M)/2. Fuel Economy estimated from fuel economy tests on a sample motorcycle from the corresponding family conducted by Harley-Davidson under ideal laboratory conditions. Not all motorcycle models undergo fuel economy testing. Fuel economy and mileage may vary among motorcycle models within a family. Your mileage may vary depending on your personal riding habits, weather conditions, trip length, vehicle condition and vehicle configuration and other conditions. Break-in mileage may vary. Engine torque values shown are nominal. Performance may vary by country and region. Standard and optional fuel systems may vary by country. Standard and optional wheels may vary by country and region. North America security system includes immobilizer; outside North America the security system includes immobilizer and siren. Seat Height measurement reflects 180 lb. (81.7 kg) operator weight. Tue-Fri: 8:30 a.m. - 6:00 p.m.